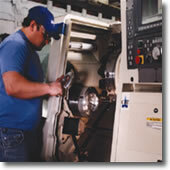 Our CNC machining services are custom rendered to maximize your return on investment. From humble beginnings in the 1930’s as a small local supplier, NPI has matured into a company that now serves customers throughout North America in the telecommunications, recreational vehicle, household products, paper, packaging, medical, woodworking and motor sports industries, form one man shops to some of the largest companies in the world. Real worth at the proper price – NPI value – is more than just a slogan. It defines every aspect of our working relationship with customers. It begins with capability and quality. We have a full complement of CNC milling and turning equipment, the latest coordinate measuring instruments, wire EDM service, full CAD/CAM capability, experienced ownership, and a dedicated workforce. We can hold and verify exacting tolerances on all standard metals, exotics, and plastics – prototypes to production runs. We are ISO 9002 compliant and work to appropriate mil specs. You can grow with us and count on your job being done right. NPI value means being easy to work with. 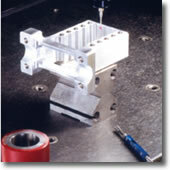 Just e-mail your prints to us and our CAD/CAM system will take your job directly to machining. No blueprints, no confusion, no delays. Your engineers can talk directly with our machinists to find ways to make your parts more easily manufacturable, saving you time and money. 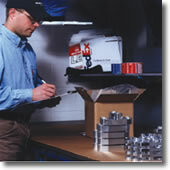 Once we understand your manufacturing process, we can anticipate upcoming needs. We can become your production partner. NPI value means dependability. We specialize in Just In Time manufacturing and ship every day to our customers via our own delivery service, UPS, Federal Express or common carrier. When you need your parts, they’ll be there, properly packaged and in pristine condition. If you have an emergency, we’ll respond quickly. You can count on us. NPI value means competitive pricing. We receive a high percentage of jobs we quote and strive to keep our customers for the long term. If you want real worth at the proper price, top quality, on time delivery, personal service and the latest machining technology – if you want excellence – then you want NPI. 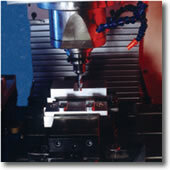 For your next job call Northwest Precision Inc. High value precision machining for the 21st century. 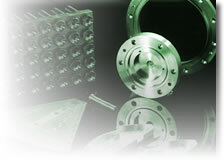 Northwest Precision, Inc. CNC Turning, CNC Milling, CNC Machining, high-precision Machining, Digitized Part Verification, Multi-Function Live Tooling, Traceable Part Routing, Precision CNC Miachining, Optimizing for the states Maine (ME), New Hampshire (NH), Massachusetts (MA), Vermont (VT), Connecticut (CT) and Rhode Island (RI)... New England.